Winter seems to just call for the slow cooker! I love my crockpot for all sorts of things, but I especially love making soups. Soups are my comfort food – I have fond memories of my mom making soups on a cold winter’s day. We would rip off a piece of warm, crusty bread to dip in and get every last drop of delectable broth in the bowl! This recipe is a nod to my time living in Boston’s North End — the Italian neighborhood! 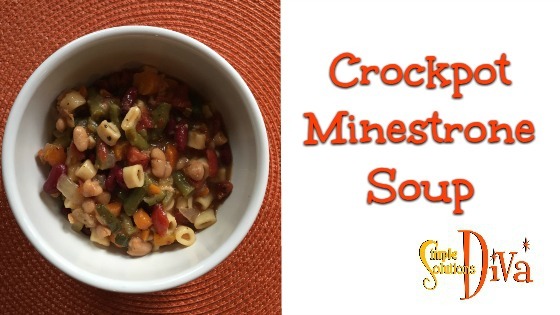 Crockpot Minestrone Soup is perfect to prep the day before, refrigerate, then set it on low for 8-10 hours. A Great Winter Warmup Recipe! Full of veggies & protein-packed with kidney and white beans, this Italian style soup will be a favorite! 2 14.5 oz cans diced tomatoes - I used Fire Roasted, with Basil, Oregano & Garlic for more flavor! 1- 1½ cups dried elbow pasta - I used Ditalini style because i like the short macaroni! Optional: You can also add ¾ cup quinoa if you want to add an extra "punch" of nutrients! Combine all ingredients, except pasta & quinoa (if using), into large crockpot. Cover and cook on high 4-5 hours, or low for 8-10 hours. In last 20 minutes of cooking add in the pasta (and quinoa if using), making sure the slow cooker is set on high for the last 20 minutes. Serve with bread and a little fresh parmesan and enjoy! This is a super recipe to prepare the day before a big event or football game (think EASY tailgating!). 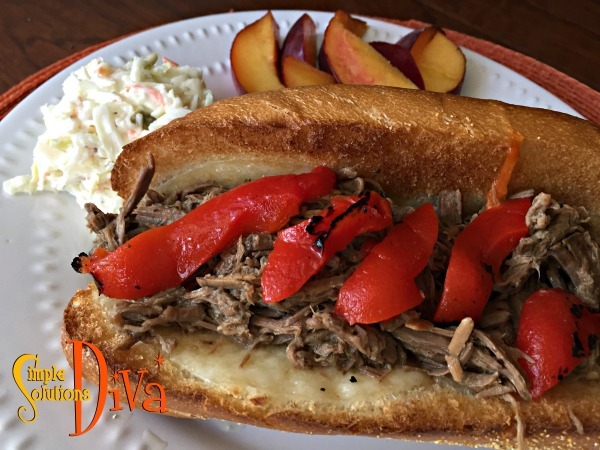 Serve on sub rolls, with a little provolone cheese, roasted red peppers – OH SO GOOD! 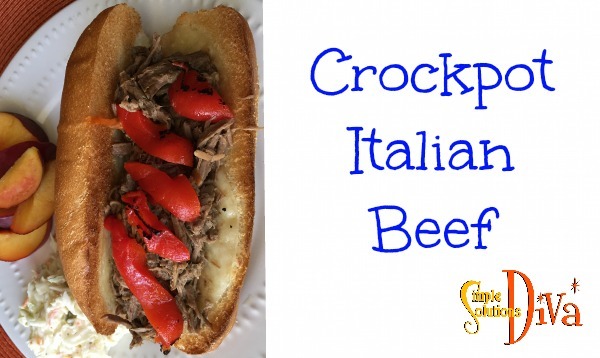 Juicy Italian-spiced beef, shredded and ready to serve at a tailgate or any informal event! This recipe is perfect to serve up on sub rolls, with a little provolone cheese, some roasted red peppers! Place rump roast into crockpot. In a saucepan, boil the water (or broth if you are using that). Add the spices, bay leaf and Italian dressing mix and stir. Bring to a rolling boil and turn off heat. Pour the mixture over the roast, then cover and cook on low for 10 hours. Serve on toasted sub rolls with melted provolone cheese, roasted red peppers and salted onions! Enjoy! Aren’t slow cookers the best? You can make something in the morning and let it cook all day until it is tender and delicious! But have you noticed so many slow cooker recipes use canned soup? IT is a short-cut to making something creamy – BUT you can’t control the ingredients! Though I am the Queen of Shortcuts, I try to make things from scratch so I can control the ingredients. That’s why this recipe is so good! It is all fresh (no canned soup here! ), so I’m in control of all the ingredients, plus it is EASY! Serve it over egg noodles and pair it with a healthy vegetable side dish – Oh SO GOOD! Enjoy! 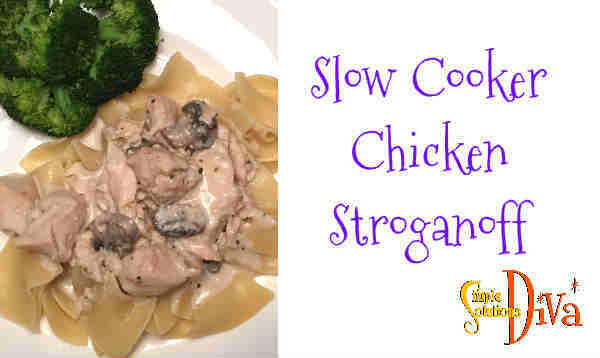 Creamy and flavorful Chicken Stroganoff is a wonderful recipe to make for guests! Serve over egg noodles, dust with a little fresh, chopped parsley! Yum! Place the cubed chicken breast into the crockpot. In a sauce pan over medium heat, melt the butter. Add the flour and whisk into a paste. Remaining over medium heat, add the chicken broth and whisk. Add the milk and whisk. Continue whisking the mixture over medium heat until the mixture is a slightly thick sauce. Add the pepper, garlic powder, dried basil, dried oregano, and sea salt. Stir well. Add the fresh garlic, onion and mushrooms. Pour sauce over the chicken in crockpot. Stir until all chicken pieces are covered in sauce. Cover and cook on low for approx. 5 hours. Add cream cheese (cube it first) and stir until melted. Add sour cream and stir. Allow to heat up - maybe 20 minutes. Serve over egg noodles, garnish with fresh chopped parsley, if desired. 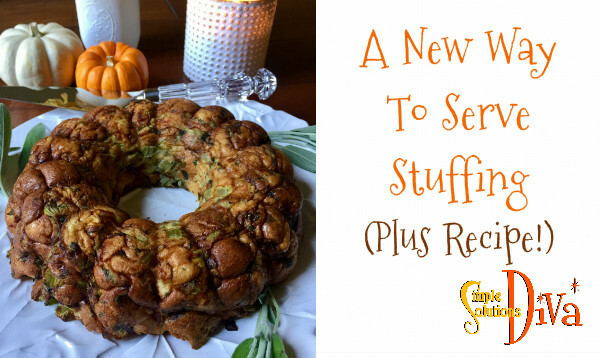 Tired of serving stuffing out of a bird’s behind? Try presenting your stuffing in a creative way (plus, you don’t have to worry about undercooking and getting salmonella!). 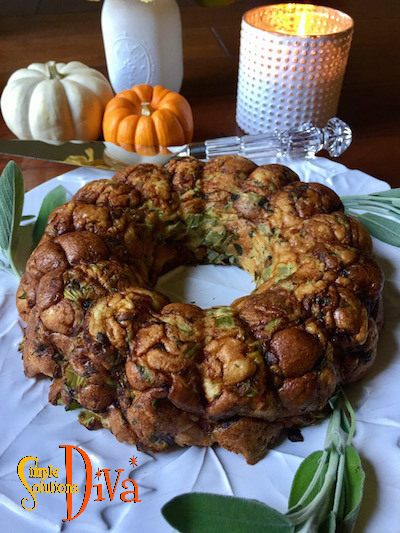 Make your stuffing in a bundt pan! It is not only healthy, but it presents the stuffing in a unique form! The key is to add eggs to your favorite recipe so it will hold together when you take it out of the bundt pan. Look how pretty it looks! You can use your own, favorite recipe, just be sure to add 3-4 eggs to your mixture (mix it in with the chicken broth you use in your recipe). Bake at 400 degrees for 30-40 minutes, until it is lightly browned. 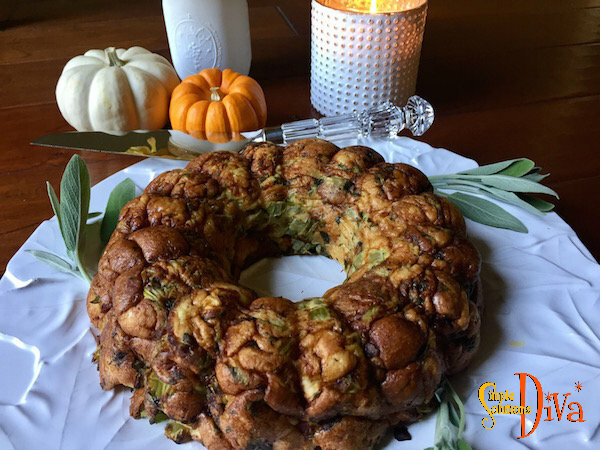 Cook this recipe separately from your turkey and be sure to cook it in a bundt pan for a nice presentation! 1 loaf of french bread, cubed and dried in a 200 degree oven until lightly toasted - about 20 minutes. Using the pan with the bacon (or pork sausage) grease, sauté the sage, garlic, parsley together for 30-40 seconds. Add the chopped bacon (or sausage) and stir. In a small bowl, mix the beaten eggs into the chicken broth. In a large bowl, place the bread cubes, the herb mixture, and mix together. Slowly add the chicken broth mixture, tossing the bread cubes to coat. Press mixture into a lightly greased bundt pan. Bake at 400 degrees for 30-40 minutes. Allow to rest for 20 minutes. My family LOVES sweet potatoes! I served these and they were a BIG hit, so I believe I will serve them for Thanksgiving this year. 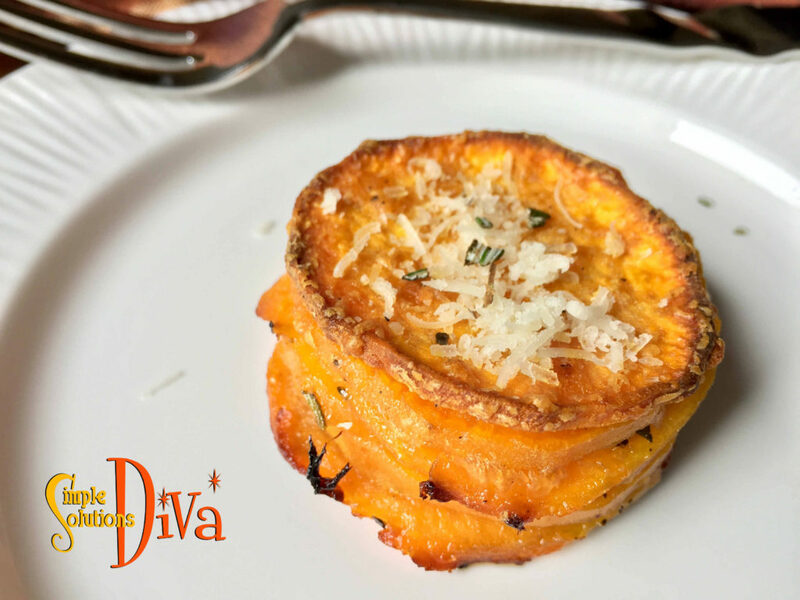 Buttery layers of sweet potatoes with rosemary and garlic and fresh parmesan cheese – my mouth is watering just thinking about them! These are a different way to serve those delectable, spuds of the South! And best part? No mini marshmallows! 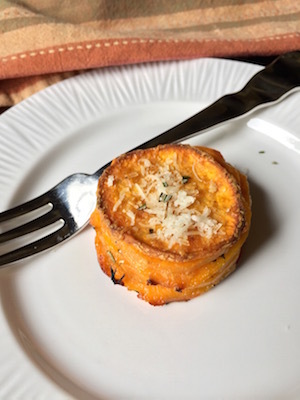 Buttery layers of sweet potatoes, paired with rosemary, garlic and fresh parmesan - these Sweet Potato Stackers are sure to be a hit at the next family gathering! 4-5 sweet potatoes, washed, peeled and sliced into thin slices. Combine in a large bowl the melted butter, olive oil, rosemary, garlic powder, onion powder, salt and pepper and whisk until they ingredients are blended. Add freshly grated parmesan cheese and lightly wish. Add sliced sweet potatoes to the bowl and mix until all slices are coated in the oil mixture. In a light greased muffing tin, layer the sweet potatoes until each tin is filled to the top. These will shrink down while they cook. Cook for 45-55 minutes, or until the potatoes are lightly browned and are tender. Place on a plate and top with more parmesan cheese and fresh chopped rosemary. Serve immediately. 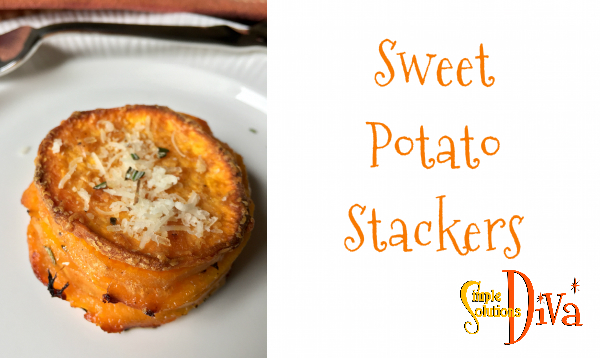 Sweet Potato Stacker – So Simple & So GOOD! One of my favorite vegetables, second only to broccoli, is zucchini! It is a very versatile veggie! 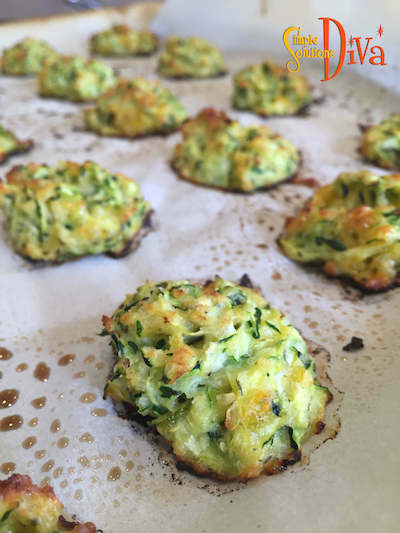 So speaking as a Zucchini Lover, this recipe is fantastic! 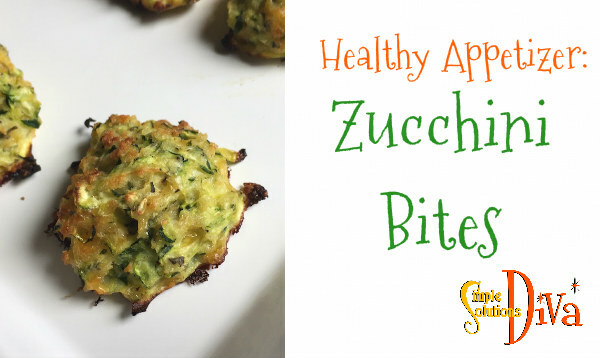 You can almost convince yourself it is healthy because it is mostly zucchini, with a little bit of cheese! Seriously, how can you not want to devour these right out of the oven?! Easy Cheesy Zucchini by SimpleSolutionsDiva.com. I suggest you double the recipe – I made a single batch and literally, all of the pieces were devoured in minutes. 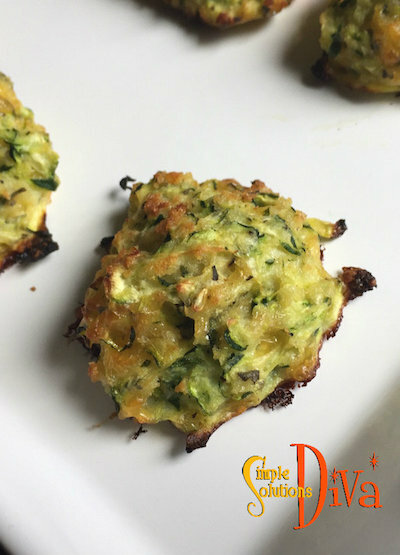 And this recipe has my little vegetarian’s stamp of approval! 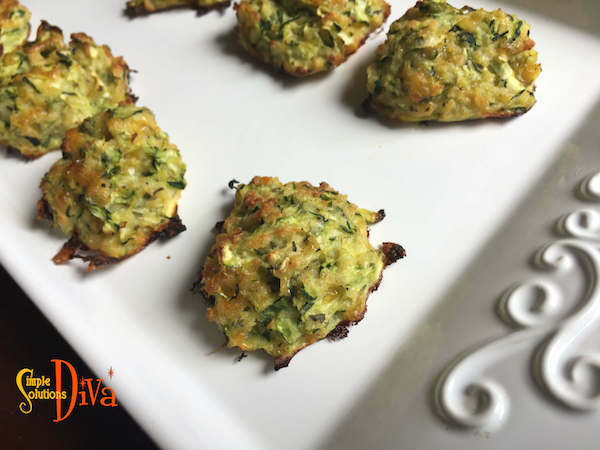 These easy, cheesy zucchini bites will have carnivores, and vegetarians alike, devouring them! After shredding the zucchini, place it into a clean, dry paper towel and squeeze out the excess water and place the zucchini in a large bowl. Bake in the oven for 14-20 minutes until lightly browned on the edges. I love a good bowl of soup, especially on cool fall evenings! I find this soup, so thick it could almost be a stew, really hits the spot! A little spicy, a little Mexican – all my favorites in one dish! I think when you try it, it will become a family favorite, too! Serve this up with some tortilla chips, a little sour cream, cheese, and maybe a little hot sauce to taste! Enjoy! 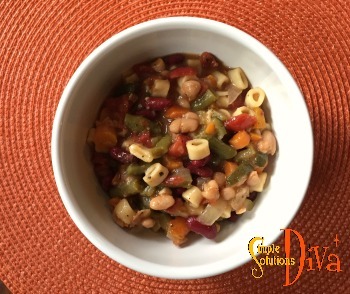 This soup is perfect to come home to on cool nights in the fall or winter! 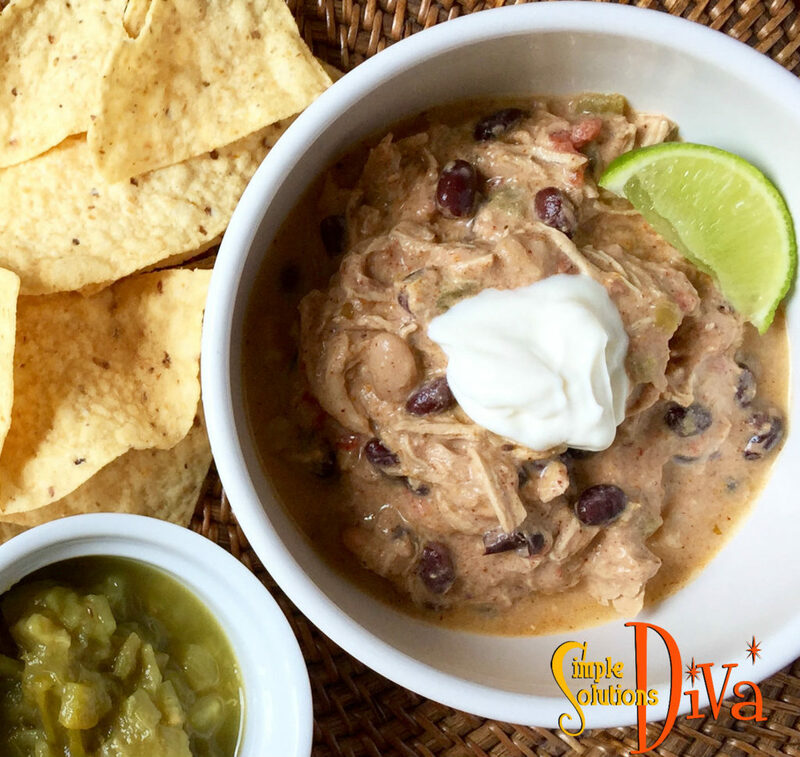 Leave it in the crockpot all day and it will make your home smell like a Mexican fiesta! 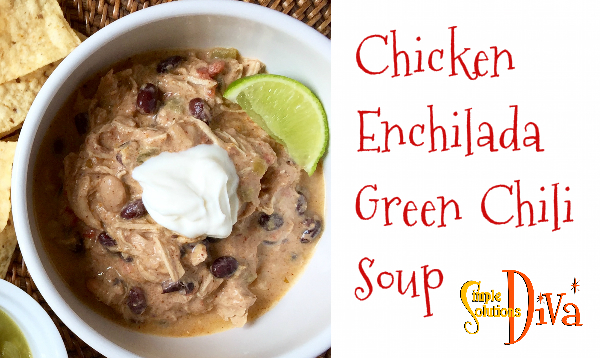 Pour half the can of green enchilada sauce on bottom of crockpot, then add chicken breasts. Top with remaining green enchilada sauce and all other ingredients, except for the cream cheese. Cover and cook on low for 8 hours, or on high for 4 hours. A half hour before serving, take 2 forks and shred the chicken. Add in the cubed cream cheese. Stir and cover, allowing the cream cheese to melt. Serve when the cream cheese is melted - enjoy! 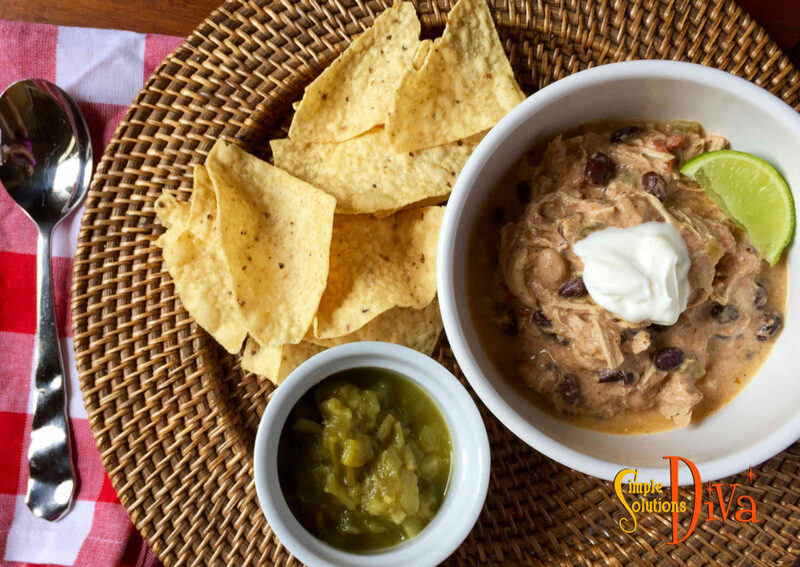 Serve This Chicken Enchilada Green Chili Soup with Tortilla Chips, cheese and sour cream! 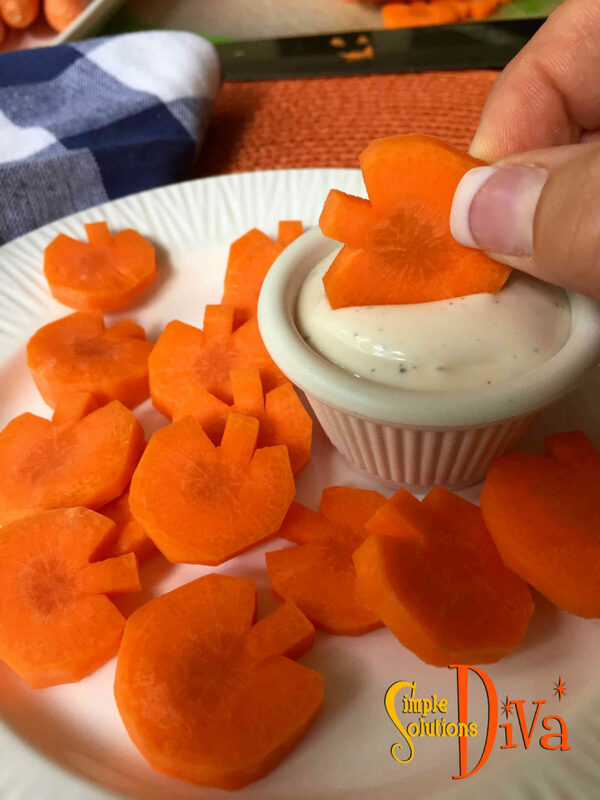 I know from experience it can be difficult to get kids to eat their veggies! For some reason, two and three year olds just don’t care when you explain that veggies are good for them! But like all good parents, we try to sneak vegetables into their diet – some with success, some without! 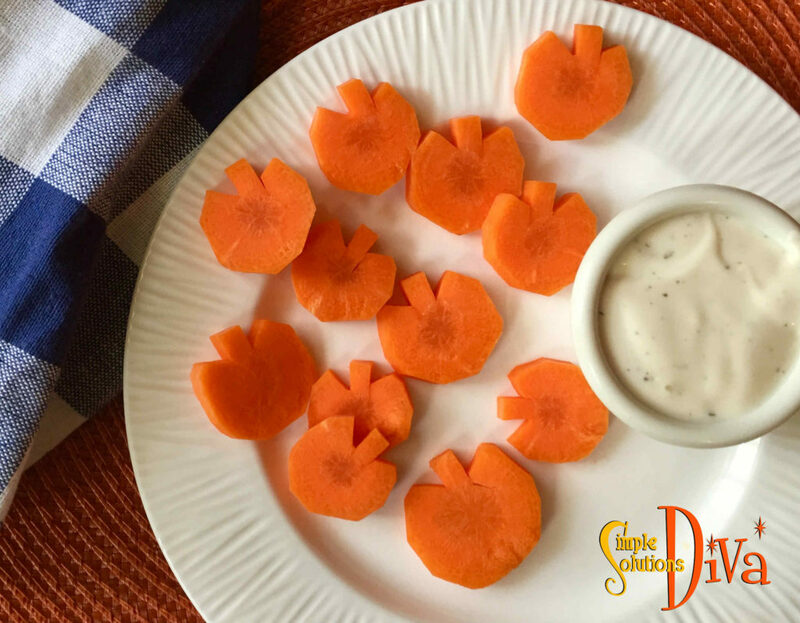 So I knew when I saw these adorable carrot “pumpkins” they would be a perfect fall treat for kids – and something a parent can feel good about giving them! I hope you like the cutting demonstration in the video! Disclaimer: When using a big knife, I don’t recommend letting the kids cut the carrots! If you want to get them involved, give them the job of peeling and washing the carrots! 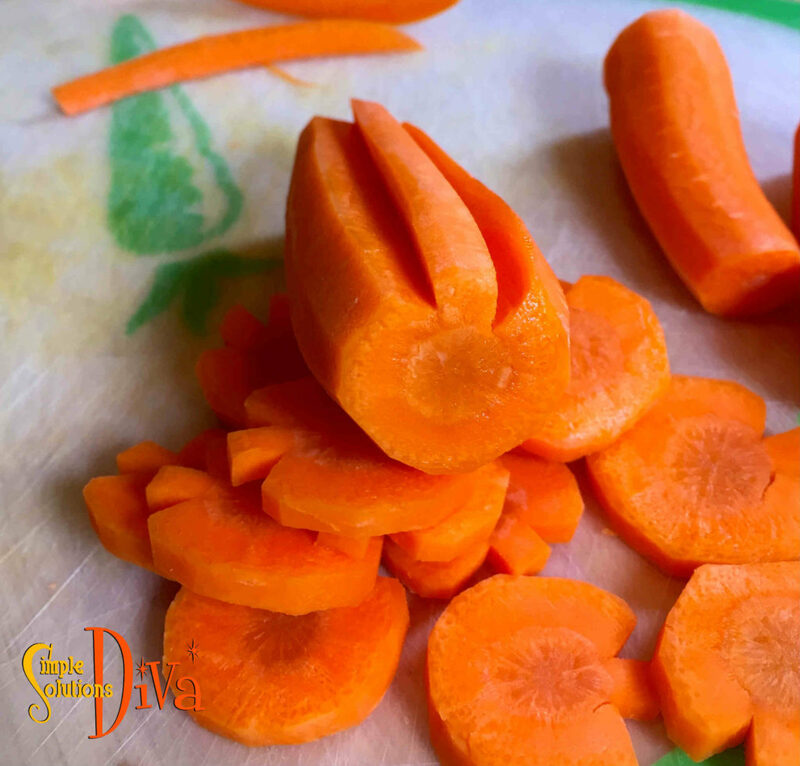 A close-up of the cut carrot – So cute! 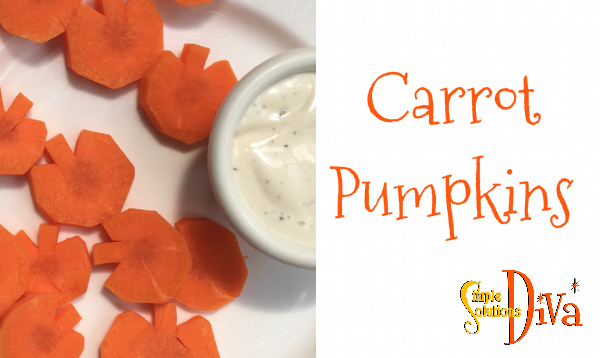 What kid could refuse these sweet & crunchy “pumpkins” – especially if they are served with dip! Or add them to chicken noodle soup for a Fall or Halloween theme! 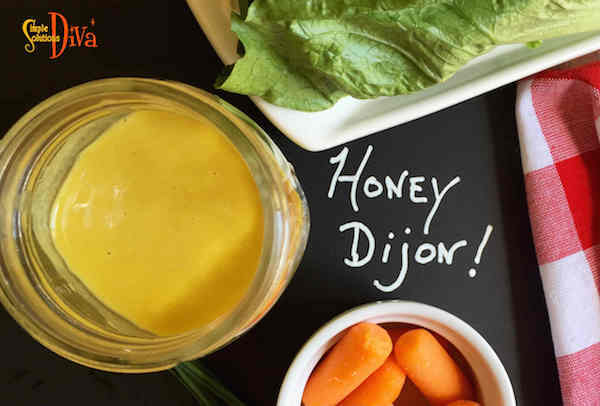 Honey Dijon Dressing – it could be another food group for some kids! My kids put it on everything, so I thought I would try to make it from scratch – no preservatives and full of flavor! 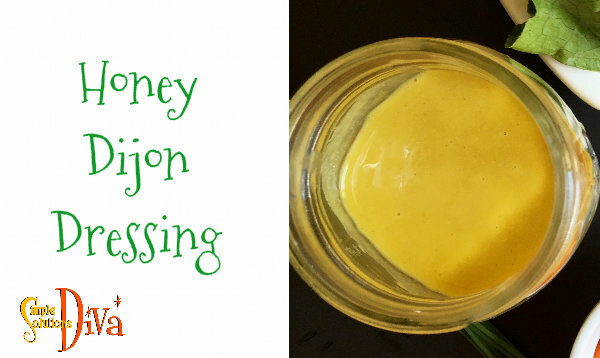 Try this tangy version is sure to make everyone happy in your home! Sweet & Tangy! Sure to be a hit!! Combine the first four ingredients and whisk. Slowly whisk in the olive oil - you may find you don't want to use the entire ¼ cup - feel free to adjust to your taste. Oh yes, I am thinking of my trip to Greece when I make this dressing! 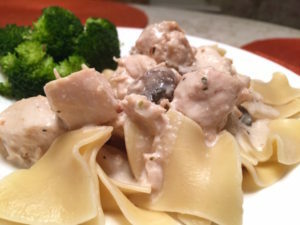 This recipe comes together so easily you will be making it every week! Pour it over salad, make it thicker and use it as a dip for veggies and pita chips! 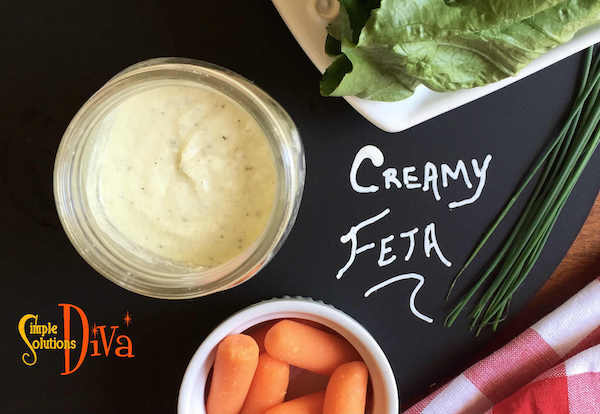 Creamy Feta Cheese dressing is perfect for a summer time salad and it comes together in minutes!! Adjust the liquid ingredients to your preference to make it thinker or thinned out. Combine all ingredients in a blender and blend! That easy! Store in an air tight container in fridge for up to 5 days.